Casino Insight™ was developed by Certified Public Accountants, Certified Fraud Examiners, and professionals who have experience in management of and accounting for casinos. 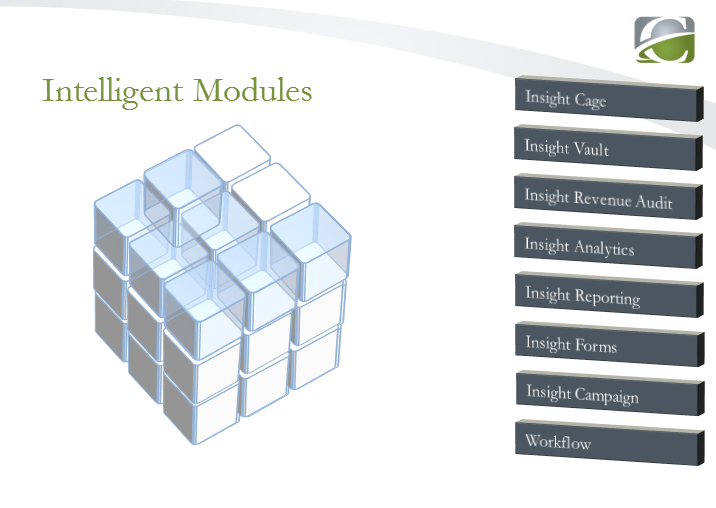 Our Insight Cage/Vault and Revenue Audit modules focus on automation and efficiencies in these key areas: Cage Transactions, Revenue Audit & Reporting, and Compliance & Fraud Deterrence. Casino Cash Trac offers the only CAS (Casino Audit System) of its kind. 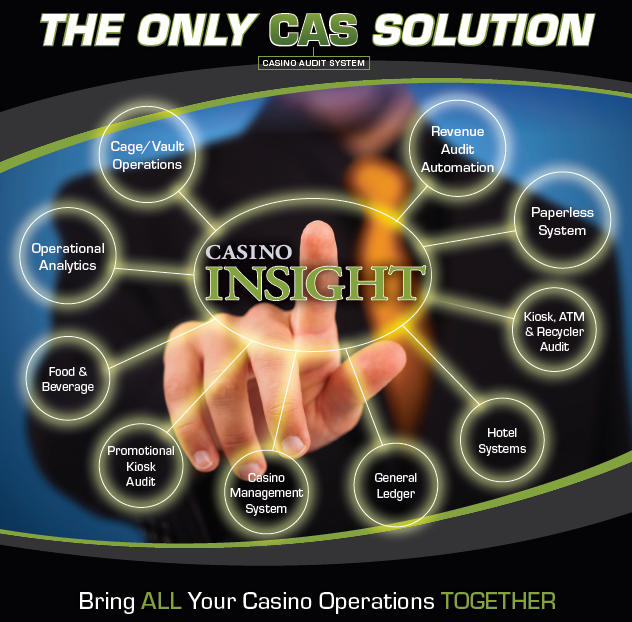 Our CAS solution, Casino Insight™ integrates, collects, automates, and manages all back of house Cage & Vault transactions and business operations. It is the only solution that integrates all transactions, from multiple systems, into Revenue Audit. Casino Insight™ allows casinos to track the flow of currency into and out of the cage & vault and between different revenue centers of the casino, including multiple properties. Common assets that are tracked via this module are cash, coins, chips, checks, markers, credit card slips, jackpots, promotional vouchers and miscellaneous paperwork. 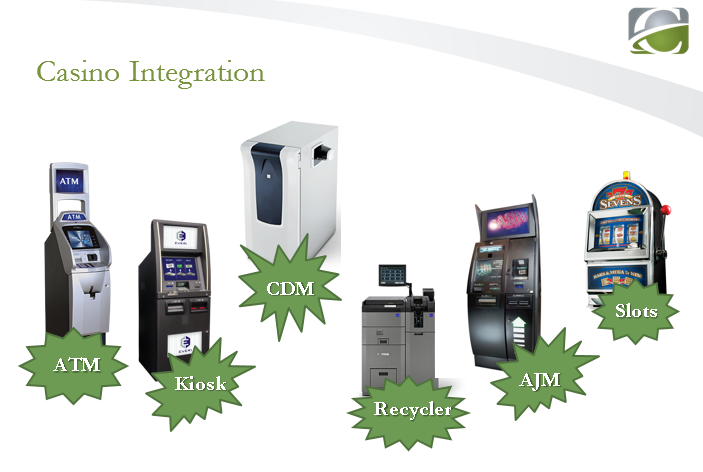 Additionally, the system compares data from Cash Dispensers, Recyclers, Kiosk and allows the revenue audit team to reconcile those external systems daily. 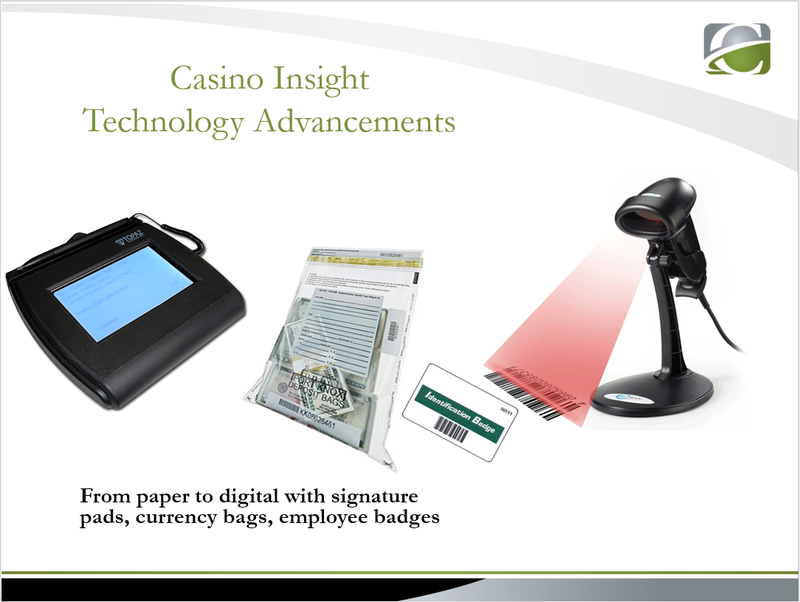 All transactions from CMS, Food/Beverage, Hotel, Kiosk, Cash Dispenser, Recyclers systems that have inventory associated with flows to the Casino Insight™ / Revenue Audit module completing the CAS lifecycle. 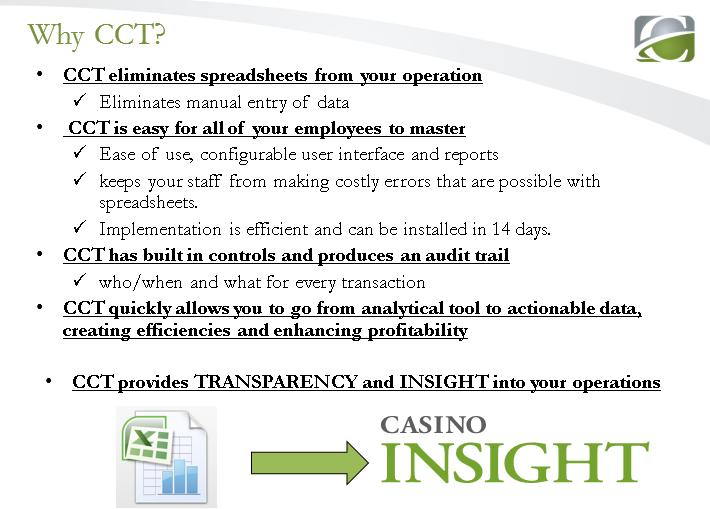 Casino Insight™ is the only solution of its kind that has a fully integrated Cage, Vault and Revenue Audit module. On the Revenue Audit side, our CAS solution merges data from all the systems throughout the enterprise into a best of breed operational analytics tool allowing for all daily and monthly audits to be completed and fed to the financial system. Our customers can manage their operations by using automation allowing staff to spend less time with excel spreadsheets and more time making decisions. 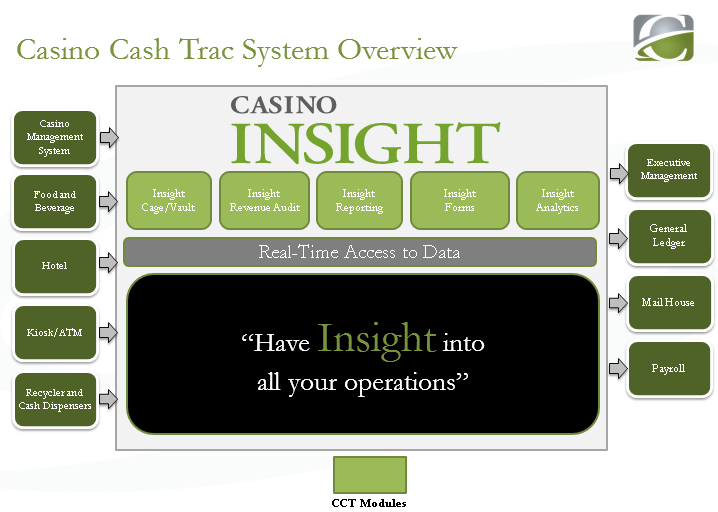 Only Casino Cash Trac and our Casino Audit System (CAS) modules parse and analyze every data point originating from cage, vault, player, slots, and revenue audit all the way to accounting giving CFOs and CIOs the most powerful operational analytical tool in the market. Kurt is the co-founded and CEO of CCT and leads the development and execution of the company’s long-term strategy. He enjoys being engaged directly with CCT’s customers and brings a hands-on approach to solving problems and developing strategies and processes that will help them advance towards operational excellence. Kurt is a CPA and has 20 years of experience in accounting, finance, business valuation, business consulting and business management. Prior to founding CCT he got his introduction into the gaming industry while conducting forensic audits for casinos and providing turnaround management for troubled casinos. Blake joined Casino Cash Trac in January 2013. He is an accomplished Enterprise Software Architect with over 17 years of experience. He is responsible for establishing the company’s technical vision and leading all aspects of the company’s technology development, managing the company’s technology initiatives and overseeing all development for Casino Cash Trac. Prior to joining the Company, he served as System Architect for a NY-based software company focused on energy, banking, and business intelligence. He is a graduate of the University of Oklahoma and the Oklahoma School of Science and Math. Wanor joined Casino Cash Trac in August 2014. He brings more than 16 years of software experience working with sales, consulting and client relations. Most of his work are with Fortune 500 companies including Chevron, Shell, UPS, FEDEX, BP, Deutsche Bank, BofA Merrill Lynch, JP Morgan, ITAU, BR Foods, TAM/LAN Airlines, United Airlines, Southwest Airlines and many others. Prior to joining Casino Cash Trac, Wanor served as Director for a software based company focused on CTRM and ETRM solutions for the financials and energy/commodities market. He also spent time in South America and Asia where he was in charge of operations for those regions and responsible for the expansion of the company business overseas. Wanor’s role is to act as the visionary “revenue architect” being responsible for driving better integration and alignment between all revenue-related areas. His main focus will be on sales, corporate development, marketing, pricing, and marketplace growth of its casino customers as the company expands domestically and internationally. He is a graduate of the University of Oklahoma. Casino Cash Trac (“CCT”) ™ develops and sells its leading product to manage the Casino’s entire accounting operations bringing INSIGHT into the Vault all the way to its General Ledger. 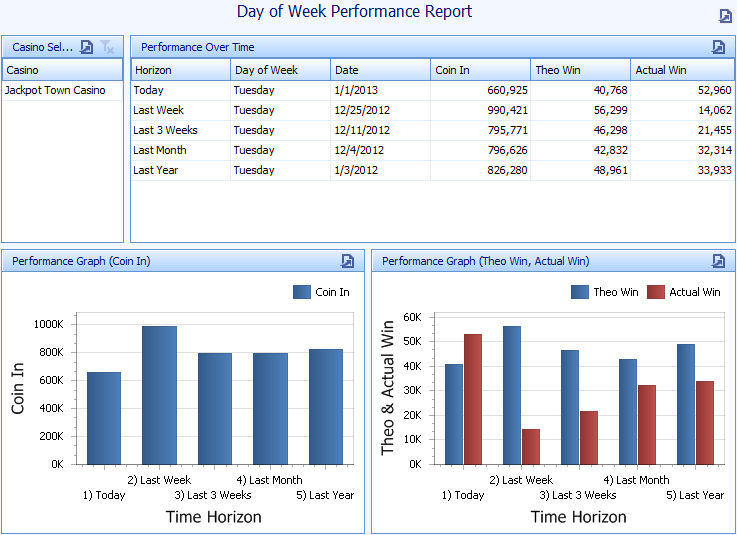 This is an example of how you can analyze your machines on a particular day of the week and compare it to previous days. This can be used to determine the effects of a promotion, holidays, and other events that may effect the performance of your machines. This report will allow marketing to see the rate at which new players are signing up at the players' club. By overlaying yearly data, this report will show both seasonality and the variance in signups for the same months over different years. 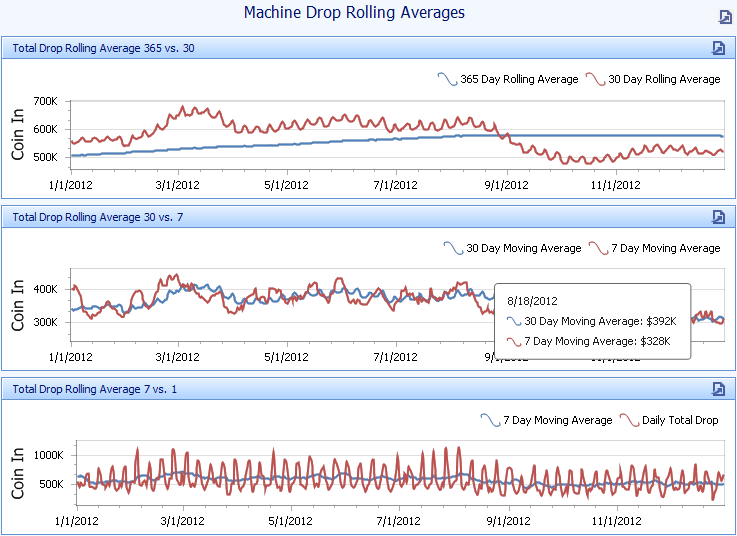 This report shows machine drop rolling averages over various time horizons. The average over the shorter horizon is an early indicator of how the longer horizon's line will trend. It will allow short-term downward trends to be acted upon before they become long-term trends. 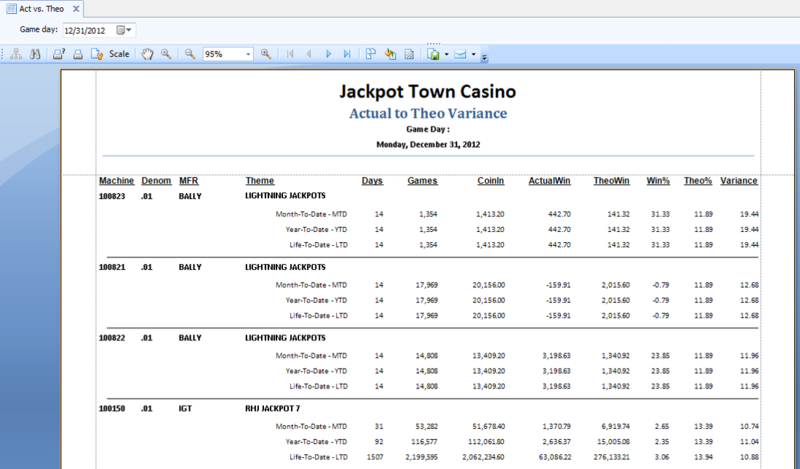 This report shows the theoretical win trends as both a total and an average daily number. 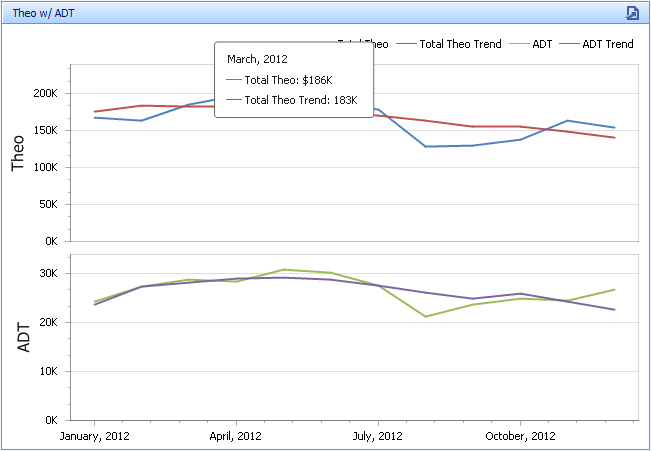 By overlaying yearly data, this report will show both seasonality and the variance in theo win for the same months over different years. 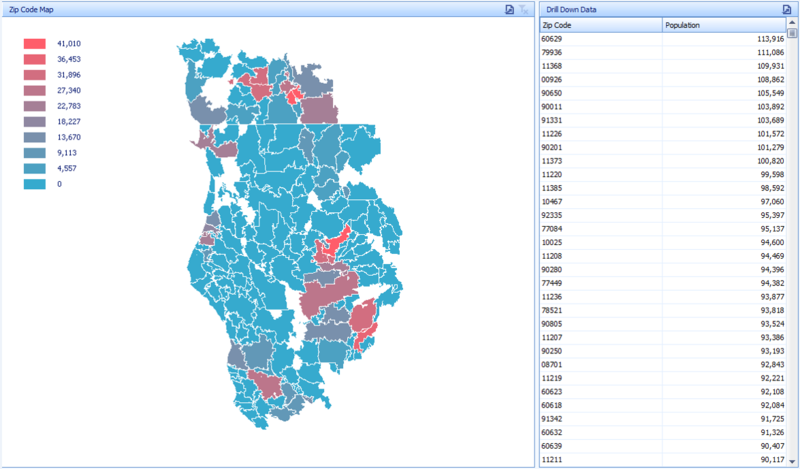 This is one example of a myriad of geographical mapping styles available to display marketing data. In this case, the report shows coin in amounts by state. 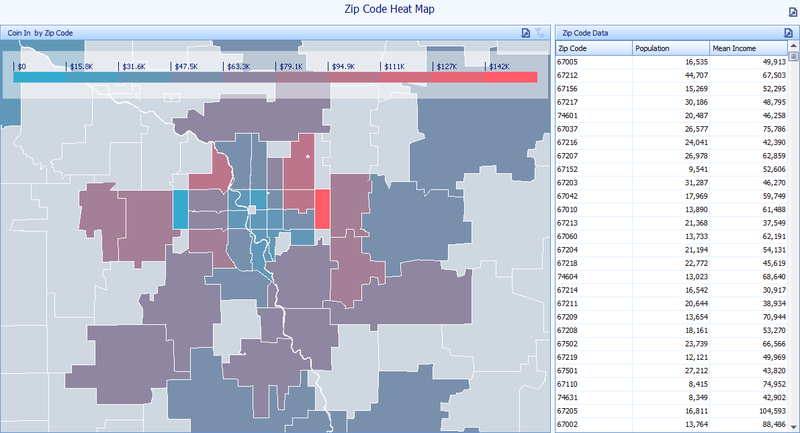 In this case, demographic data is shown by ZIP code which can support marketing strategies. Casino Insight's demographic data contains income data, population broken down by gender, race, and population growth rate. By overlaying actual patron data, reports can calculate market penetration and which ZIP codes are contributing the most players or activity. 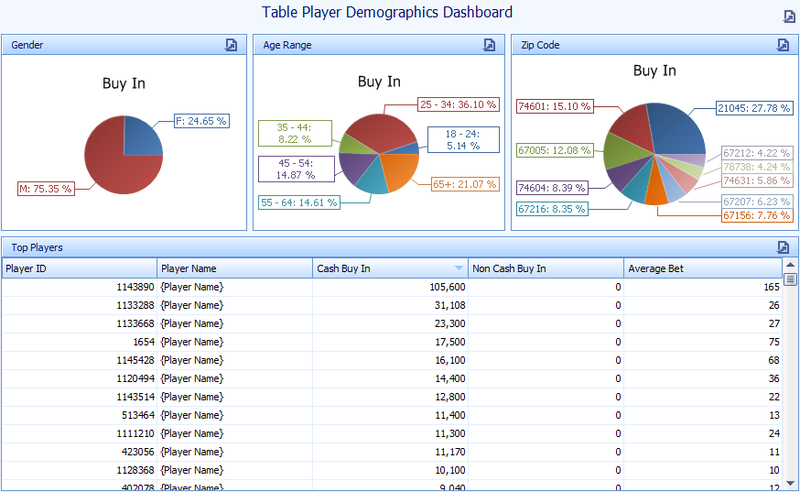 This is an example dashboard to analyze table game players. In this case, buy-in is analyzed by gender, age range, and ZIP code. 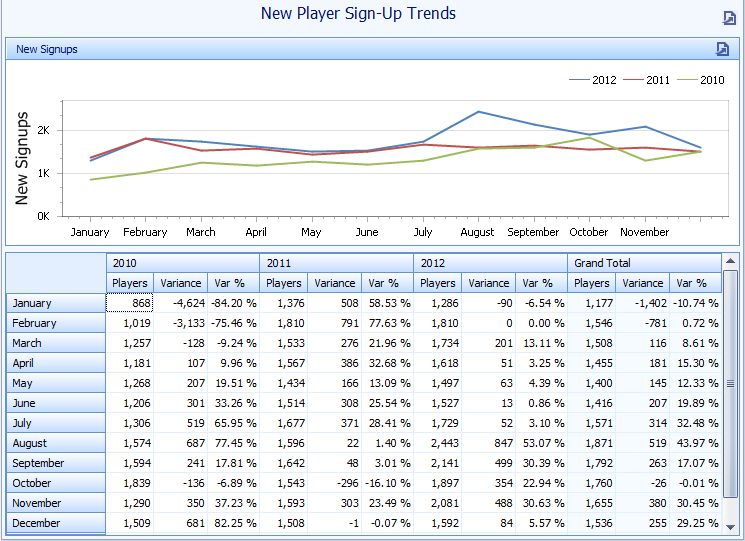 This report will show overall trends by players. This report calculates the "slope" representing the trend in their activity. In this dashboard, the players can be drilled down based on player ranking and age band. 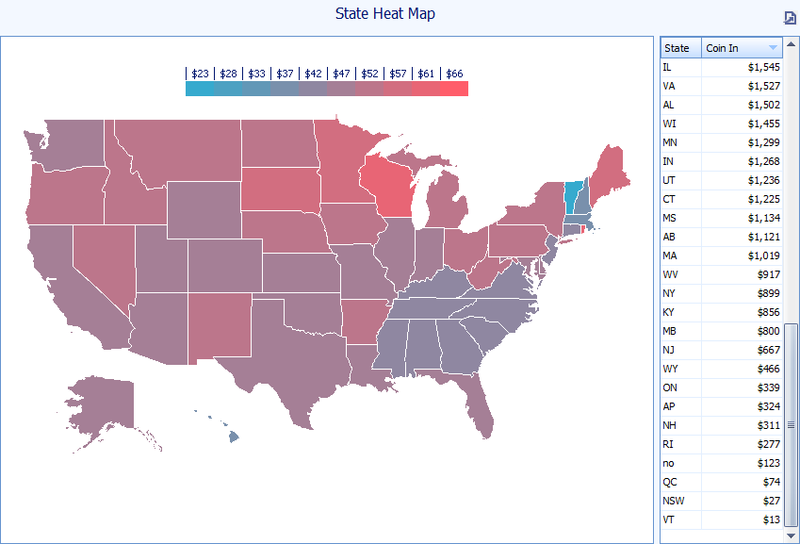 Individual players can be selected in order to see their trends. 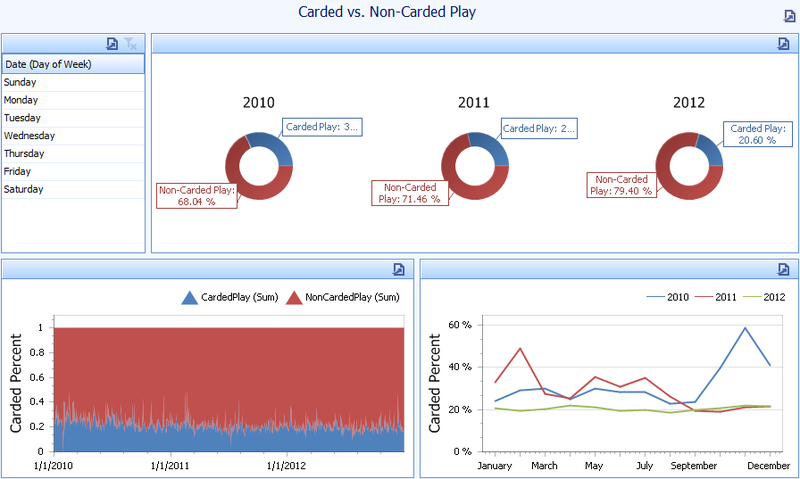 This dashboard will show the carded vs. non-carded play in various visualizations. It will allow analysis of carded play percentage by day of week and by year. 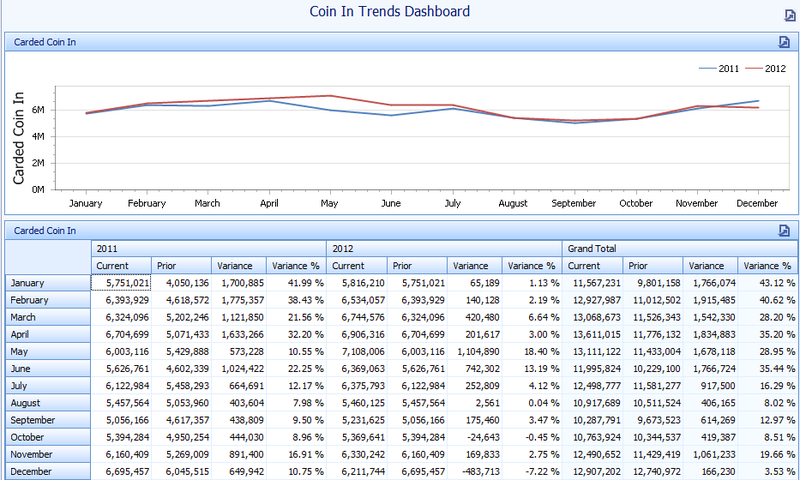 This report shows the coin in trends over time. By overlaying yearly data, this report will show both seasonality and the variance in coin in for the same months over different years. This dashboard is designed to show coin in data over a period of time and allow the user to slice and dice the information by multiple dimensions of time (Year, Month, Day of Week, Week of Month, etc.). 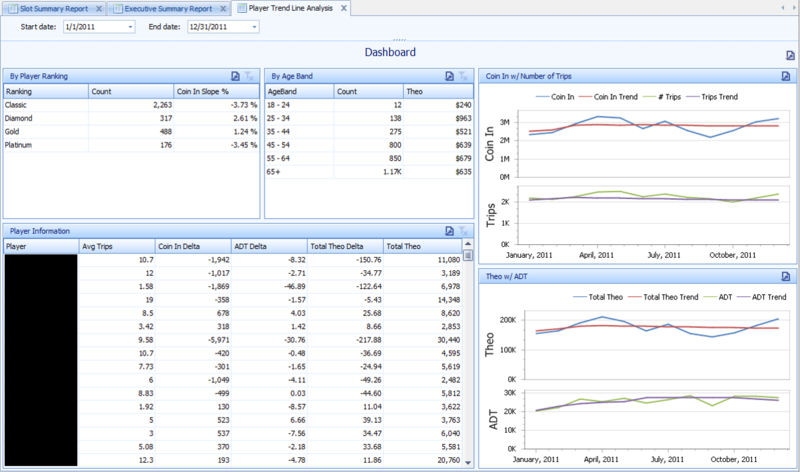 This dashboard is an example of how machines can be analyzed by vendor and theme. Casino Insight is the first of its kind Casino Audit System (CAS), and is the only fully integrated software solution that consolidates all aspects of your casino operations. Maybe that's why over 100 casinos across 13 states have partnered with us since we launched just 5 years ago. Knowing where you’re going begins with understanding precisely where you are. Casino Cash Trac performs a detailed assessment to ensure the right architecture and procedures are in place. Our consulting experts will assess your organization's strengths and opportunities; assist in educating relevant stakeholders; advise you of recommended business process shifts; share industry best practices; and a provide step-by-step plan for your organization. 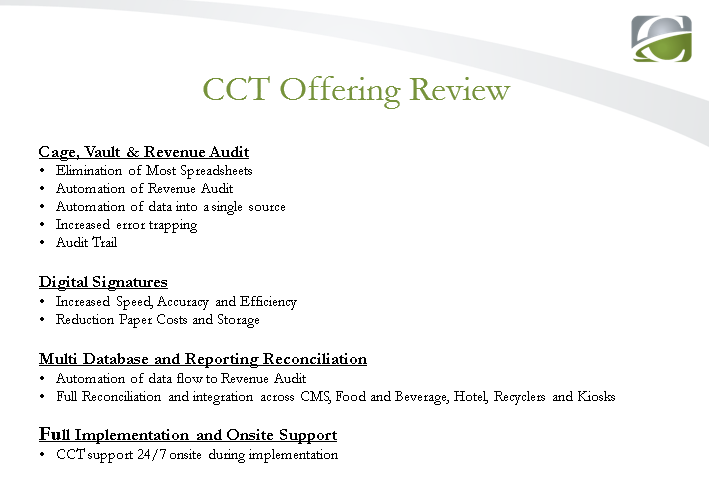 Achieve rapid ROI through CCT’s carefully guided implementation process. During this phase our staff will configure and implement the system around the parameters agreed upon during the Planning phase and will be communicating with the Project team to ensure all configurations meet expectations and everyone is ready for Go Live. Following the Go Live our team will continue to be onsite for up to 3 days running side by side with your casino employees to ensure a smooth transition and a successful implementation. Casino Cash Trac was built to enable business users, and so was our support team. Our team can assist with installations, configurations, troubleshooting, report creation, and general questions. Plus, you can get live assistance 24 hours a day, 7 days a week. Our relationship does not end after the implementation and the success of our company depends on our customers being happy and empowered so our Support team lives by the rule: Customer happy means CCT is happy. CCT will be hosting its First Annual User Conference on May 7 and 8 at River Spirit Casino. Please join us where you will have a great opportunity for everyone attending to engage in focused breakout sessions with your industry peers, hear use cases from current customers and be presented with some of CCT’s latest product developments across our Casino Audit and Analytics product offerings. CCT named to Inc. 500 for second year in a row! Casino Cash Trac ranked as the #15 Software company in America, and #247 in the most prestigious ranking of the nation's fastest-growing private by Inc. 500. CCT goes live with first property in Nevada and the famous Las Vegas Strip. Tropicana Casino is live with our Casino Audit System and seeing immediate savings across their cage and revenue audit operations. CCT completes installation of Casino Insight across all Osage properties. Osage is now part of the growing list of customers using our Casino Audit system across all their properties. Welcome Tropicana, Little River, River Cree and Osage to the growing list of customers utilizing Casino Insight and the first of its kind CAS (Casino Audit System) for their casino operations. CCT is now installed in over 100 casinos in 13 states including Virgin Islands and Canada. 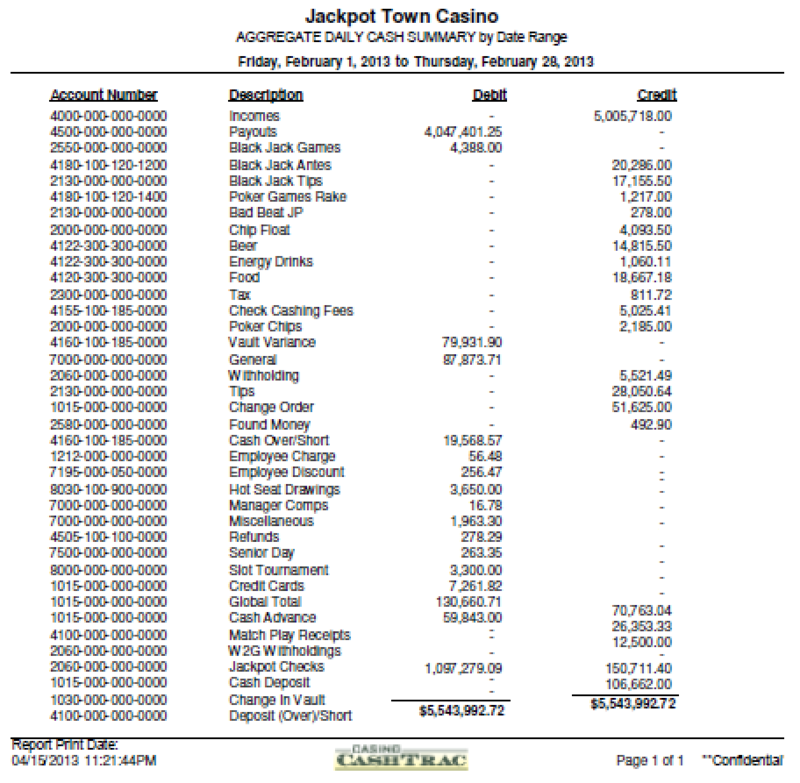 "We selected Casino Cash Trac to manage our transactions in and out of the vault. CCT’s suite of tools replaced our old accounting system and also streamlined our process from the cage to revenue audit allowing our entire operations to be more efficient." CCT completes our first Tribal Gaming Webinar covering Revenue Audit and Cage Automation: Protecting Your Casino's Assets While Boosting Revenues. To download our supporting documentation for some of the facts we covered please click here. If you would like to access the webinar recording please send an email to wfranca@casinocahtrac.com and we will send you a link with all the details. Bright, driven, and excited by opportunity? Want to join a team of software and business professionals who are challenging the way applications are delivered? CCT’s innovative CAS solution is re-defining the market. We’ve made a good start and now we’re growing. If you like what you hear and think you’ve got what it takes, please read on and apply today to wfranca@casinocashtrac.com. Thank you for your interest in Casino Cash Trac. Feel free to contact us with questions, comments, or for more information. Copyright © 2017 Casino Cash Trac. All Rights Reserved.